Come join the FUN at NCSU Club! 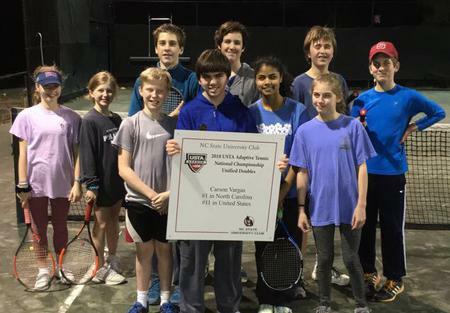 "Where Champions Play"
JUNIOR TEAM TENNIS REGISTRATION IS OPEN! Home Matches begin promptly at 5:30pm on Fridays. 1.) You must be a member of the USTA. 3.) Click the "Tennis Link" link at the top of the page. 4.) Click the "Junior Team Tennis" link near the top of the page. 5.) Click the "Have a Team ID?" link near the top of the page. The 2019 Spring Junior Team Tennis will soon be available for registration. All Intermediate Matches will be played on Fridays at 5:30pm or 7:00pm. The Intermediate League is for players with some match experience who can consistently serve with minimal double faults. University Club Junior Team Administration fee is $25.00.